Many people are concerned about feeding the world, and rightly so. By 2050, the global population is expect­ed to exceed 9 billion. The UN Food and Agriculture Organization predicts we will need over 50 percent more food to support this greater population. People are also expected to be wealthier and eat more meat. That increase in de­mand will require more agrarian resources. But how can this be done? Most of the world’s fertile land is already in use, and much is depleted or threatened. Corporate agriculture giants say that we can boost productivity and meet demand only by adopting their model of industrial agriculture — massive, single-product operations dependent on geneti­cally modified seeds and heavy doses of chemicals. This sounds familiar. Not long ago, energy giants claimed that the only way to power the world was to expand the conventional fossil-fuel-based energy system. That thinking ignored the costs of industrial pollution and the waste throughout the system, and underestimated the potential for innovation. Today, we know that an energy system focused on efficiency and clean, renewable, distributed generation is ca­pable of powering our future. Perhaps a similar vision of a cleaner, more effi­cient, less concentrated food system is what we need today. By redesigning to radically reduce all types of waste from farm to fork, we can meet the challenge of feeding people without compromising other hu­man needs such as safe water, clean air, fertile soil, and a stable climate. Indeed, we would have land available to manage for carbon sequestration to help slow climate change, an added benefit at no addi­tional cost. 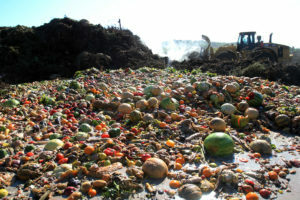 In the United States, this new vision means not only cutting food waste, but rethinking the agri­cultural policies that encourage the production of highly wasteful animal feeds and products, counter-productive biofuels, and non-nutritious processed foods, as well as those that allow the wasteful and harmful use of farm inputs such as fertilizer and pes­ticides or herbicides and soil resources. The indus­trial agriculture system is rife with inefficiency, and if we end that waste, we will have the resources to deliver healthier food to more people with less harm to air, water, and climate. Today, most agriculture in the United States, and in an increasing number of countries across the globe, is a highly industrialized process. It is capital and chemical intensive, highly concentrated, heavily mechanized, and conducted on a massive scale. The U.S. agricultural sector uses 1.1 billion pounds of pesticides and 43.5 billion pounds of fertilizers each year. U.S. Department of Agriculture data show that just three crops — corn, soy, and wheat — dominate rural landscapes, covering more than 200 million of the roughly 330 million acres of active cropland in the United States. More than one-third of the coun­try’s vegetables and two-thirds of its fruits and nuts come from California’s Central Valley. The pastoral family farm — always more myth than reality — is of little relevance to today’s industry. According to the 2012 Census of Agriculture, 80 percent of food is produced by only about 8 percent of farms. Fi­nally, wide commodity price swings and frequent over-production depress farmer returns, so over 40 percent of American farmers have off-farm jobs to make ends meet. There is simply not enough land or water available to expand this current industrial agricultural system. According to USDA, agriculture consumes 80 percent of the wa­ter and 60 percent of the land in the con­tinental United States. And additional productivity gains are unlikely to be the source of growth. USDA data show that farm productivity grew by an aver­age of only 1 percent annually in the early years of the new millennium, down from 2 percent annually during the period from 1950 to 2000. According to the National Academy of Sciences, there is little evi­dence that genetically modified seeds — despite all their purported advantages — are actually produc­ing more food per acre. Moreover, productivity gains there have taken a toll on other human necessities. As U.S. agriculture has become more industrial­ized, the agricultural sector has become one of the country’s largest polluters. Our vital natural systems and human communities already suffer from excess pollution; we don’t need more. Agriculture is the largest source of nitrate pollution in U.S. waters. Pesticides that run off fields contaminate groundwa­ter throughout the country; for example, EPA data show that the pesticide atrazine is found in almost 80 percent of drinking water systems. Air pol­lution from industrial livestock operations, including toxic (and pungent) chemicals like ammonia (of which animal agriculture is the largest source in the United States) and hydrogen sulfide, endanger people’s health and erode quality of life in rural communities. Agricultural pollution is the cause of the dead zones in the Gulf of Mexico and hundreds of other places and the algae out­breaks in Florida; it is the source of drink­ing water contamination in Toledo, Des Moines, and the Central Valley, among other places. Intensifying and expanding this harmful system makes little sense. Climate is another cause for concern. We should look to agriculture, which re­lies on biological processes that remove carbon dioxide from the atmosphere, to help slow or reduce climate change, but instead it is now a substantial contributor. According to the Environmental Protection Agency, agriculture is responsible for more than 80 percent of emis­sions of nitrous oxide, a greenhouse gas almost 300 times more powerful than carbon dioxide. Agricul­ture emits almost as much methane, another potent greenhouse gas, as the entire oil and gas sector. In ad­dition, U.S. demand for agricultural products such as palm oil and beef are a major factor driving global deforestation, which releases vast stores of carbon di­oxide in forest soils. Researchers around the world agree: absent a change to our diet and methods of food production, even the most aggressive climate solutions leave us at great risk. Indeed, worldwide agriculture itself is one of the sectors most at risk from climate change. A recent MIT study found that, even if all carbon-cutting pledges made in Paris were carried out, staple crops in major breadbasket regions and important water supplies would still be at risk. Farms, especially large industrial monocultures, already face increased risk from droughts, flood, heat waves, insect attacks, and erosion, all of which will be exacerbated by cli­mate change. We should be leery about expanding a model of agriculture and meat production that puts our food production at risk. The real issue is not how to grow more food, but how to waste less and make bet­ter use of the food we have and the re­sources we use to produce it. Currently, we waste food, agricultural inputs, crops, and cropland. There are inefficiencies throughout the food system. Viewed from another perspective, these are all opportunities. In the United States, we trash 40 percent of our food, according to researchers at the National In­stitutes of Health, mostly from our homes, restau­rants, and stores. Throwing out edible food is an obvious form of waste, like a leaky fuel tank. But there’s also waste that’s designed into the system, like a gas-guzzling car or sprawling suburban devel­opment that forces people to drive great distances. Waste begins long before the food hits our plates. Conventional beef is a prime example of ineffi­cient food production. According to USDA, about half of U.S. cropland is used to grow feed for ani­mals in industrial livestock facilities, which produce almost all of the meat and poultry we eat. But feed­ing animals grain is highly inefficient. According to industry sources, most feedlots require about six pounds of grain to increase a cow’s weight by one pound, and less than half of the cow becomes usable meat. That’s about as efficient as filling the gas tank of an SUV that only gets six miles to the gallon. If you fed the same amount of grain to hu­mans, according to the American Journal of Clinical Nutrition, you could support 840 million people. It’s not just inefficient but also harmful: the Ameri­can Heart Association recommends we eat less red meat to protect our health. Another waste of food is the prevalence of pro­cessed foods in the American diet. A recent study estimated that 75 percent of the average American’s calories come from these foods, which are largely made of corn, wheat, soy, and some animal prod­ucts. 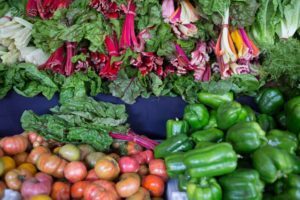 This “commodity-based diet,” according to the Journal of the American Medical Association, is deficient in nutrients present in whole and mini­mally processed foods. Thus, people have to eat even more food to get the nutrients they need and explains how people can be both undernourished and obese. 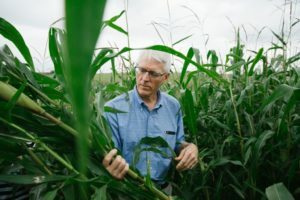 According to researchers at the Univer­sity of Minnesota, the average American cornfield feeds only three people per acre, making it less pro­ductive than farms in Bangladesh. Despite their lack of nutritional benefit, we continue to devote valuable resources to processed foods. About 2.5 million acres of corn are destined to become high fructose corn syrup, mostly for soft drinks. Another 2 million acres go to sugar beets and sugar cane. In sum, we use fertile farmland the size of New Jersey just to grow sweeteners. Given that sugar-sweetened beverages have been linked to obesity, diabetes, and cardiovascular disease, this use of land isn’t just wasteful — it’s dangerous. When we consider the net benefits of using 27 million acres to produce corn for ethanol, we end up in the red again. A 2014 article in Forbes pointed out that the amount of corn it takes to fill a single 25-gal­lon gas tank with ethanol is enough to feed one per­son for a year. On a global scale, the amount of corn the United States uses to make ethanol could feed 500 million people. Most studies show that corn eth­anol doesn’t provide significant climate benefits com­pared to gasoline. Turning corn into ethanol may be convenient but, like using furniture for firewood, it’s not a smart long-term strategy. Valuable farm resources such as fertilizer are also wasted. Crops need fertilizer, and U.S. farmers rely mainly on expensive, synthetic nitrogen fertilizer for their crops. Numerous studies show that a ma­jority of farmers apply far more fertilizer than crops need. An average corn plant uses just 37 percent of the nitrogen fertilizer it receives. The excess isn’t just wasted — it pollutes our air and water. Producing fertilizer is also energy intensive. EPA and industry data suggest that over 500 tons of car­bon dioxide are emitted for each ton of nitrogen fertilizer produced. This means that the production alone of the 12,000 tons of nitrogen fertilizer ap­plied each year emits over six million tons of carbon dioxide — the equivalent of about one million cars. Industrial agriculture also relies on genetically modified seeds that allow spraying herbicides on en­tire fields, rather than just on weeds. Similarly, indus­trial animal facilities routinely feed animals antibiot­ics to prevent disease, rather than just for treatment. These practices waste these useful products and also waste their effectiveness — weeds are developing re­sistance to herbicides and bacteria to antibiotics. Finally, industrial agriculture wastes the land it­self. Iowa, which produces more corn than any oth­er state, provides an example. According to USDA figures, an average acre of cropland cultivated in Iowa produces about 5 tons of corn each year, but loses roughly 6.3 tons of soil through water and wind erosion. For every pound of corn, we lose over one pound of precious soil; for every pound of feedlot beef, we could lose over 15 pounds of soil. It seems irrational to scale up such a wasteful and harmful system, especially when there are alterna­tives. Efficiency could be an important part of the solution. According to the Department of Energy, energy intensity — energy consumption relative to real GDP — was cut in half in the United States over the past 40 years, while economic output more than tripled. In California, energy efficiency has helped keep per capita electricity use flat since the 1970s, despite tremendous economic growth. To reshape our agricultural system, we must not only reduce food waste from farm to fork, but also in­crease the efficiency of what we choose to grow and how. In other words, we need to produce more nu­tritious foods for humans and less feed for animals and fuel for cars. Another lesson to adopt from energy — and from the IT sector as well — could be to shift from a centralized model of production to a distributed, interconnected network. Once, industry experts thought that the only way to provide electricity was to pair a few large central generating stations with an extensive network of transmission lines running out to consumers. Today, we are moving toward a grid that makes use of many smaller-scale genera­tors, such as wind turbines and millions of residen­tial rooftop solar arrays, which communicate with each other to provide a steady supply of power even though each individual generator’s production may be intermittent. A networked system can also work to reduce demand from some users during times of peak demand. Similarly, the old computing model of massive, centralized mainframe computers has been replaced by networks of connected smaller computers and devices. These distributed, inte­grated networks help scientists share research data, supply information on financial markets, and send real-time traffic updates to your navigation app. Perhaps farming could develop along the same path. We could aim to supply ample nutritious food, but not excess unhealthy or wasteful food. Instead of requiring big­ger and bigger industrial operations to produce ever more, we could satisfy real demand with a large number of decentralized, less resource-intensive, more-diversified farms. Hundreds of farmers could work together to create a network to supply large consumers such as supermarkets or school systems; those large consumers could reduce demand for say, off-season tomatoes, by building greater flexibility into their menus. Data sharing could also help farmers reduce waste by giving them access to real-time information to target the best market opportunities. Agriculture in this new system would focus on growing healthy food. To date, research and policy have focused on increasing production of calories per acre, but we find that many of those calories are wasted. We could instead focus on producing more nutrition per acre, just as power companies now focus on the services delivered, not simply kilowatt-hours. Is this vision possible? For the most part, we’ve never tested it. For farmers, changing what you grow and how you grow it is an enormous and risky undertaking. And right now, U.S. farm policies cre­ate powerful incentives for farmers to keep growing monocultures of corn and soy or keep on expand­ing animal factories on a massive scale. But those policies could be changed. The multi-billion-dollar Federal Crop Insurance Program, for example, is designed to provide a safe­ty net for farmers, but has evolved to mostly sup­port the planting of commodity grains. According to the Congressional Research Service, more than 70 percent of the acres covered by crop insurance are devoted to one of four crops — corn, soy, cot­ton, and wheat — and another 20 percent covers pasture and forage for animals. The Council on Food, Agricultural, and Resource Economics found that the system encourages the planting of crops on wetlands and other marginal land that require mas­sive inputs of chemicals to produce decent yields in the best of years. Moreover, “best farming practices” required for crop insurance are often outdated so that farmers are discouraged from using more sustainable prac­tices. 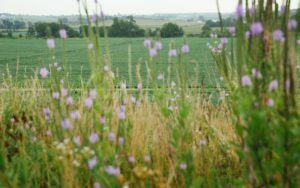 A 2015 National Wildlife Federation survey found that 45 percent of farmers who had expressed interest in planting cover crops had not done so due to concerns about crop insurance requirements. And more than one third responded that they had been told by an agent or adjustor that plant­ing cover crops increased the risk that claims would be denied. Crop insurance offers few if any incen­tives to use natural strategies, not just cover-cropping but also no-till farming, that protect soil, improve resilience to droughts and floods — and reduce the need for insurance payouts. Other Farm Bill programs base their payments on historical plantings or acres planted in certain crops, making it even more difficult for big corn and soy farmers to shift to growing anything else. With the Farm Bill coming up for reauthori­zation in 2018, there is a chance to revisit and revise these policies. It’s not just the Farm Bill; other agriculture policies also encourage waste. In surveys conducted by agricultural extension programs, farmers report that they get much of their techni­cal information from product companies, such as fertilizer sales representatives, who tend to encour­age ample, and often excessive, nitrogen fertilizer or pesticide use. Extension programs themselves are often heavily influenced by agro-chemical companies, and they often discourage the use of successful alternative agro-ecological approaches. An Iowa State study found that longer crop rotations and crop diversi­fication produced higher yields and greater profit­ability than conventional corn and soy production — while reducing herbicide use by 88 percent. 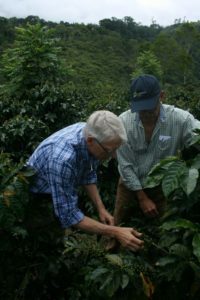 Other studies have shown the same, leading Olivier DeSchutter, the former UN special rapporteur on “the right to food,” to remark that “agroecology out­performs large-scale industrial farming for global food security.” Yet despite agroecology’s track record of success, less than 15 percent of external USDA grants, according to a 2015 analysis by the Union of Concerned Scientists, fund projects that include agroecology, and only 4 percent go to projects that could be considered transformative. Research dollars flow instead to projects that can leverage private-sec­tor funding, likely supplied by companies that sell products agroecology helps farmers to avoid. Despite the industrial nature of the largest farms and animal production facilities, pollution laws typ­ically exempt, or are read to exempt, these facilities, allowing them to sidestep the costs associated with the pollution. Smaller, more integrated, or simply better managed farms that produce food without the same pollution are at a competitive disadvantage when others can pollute with impunity. At the other end of the food chain, current poli­cies do little to shift demand. Other countries, no­tably China and Brazil, have issued dietary guidelines backed up by professional health organizations and research institutes urging less meat consumption. But in the United States, similar science and health-based recommendations were rejected by USDA due to political pressure, further ensuring that the inefficient grain-to-meat system perpetuates itself. Other policies, most important­ly the Renewable Fuel Standard enacted by Congress in 2007, have effectively created a multi-billion-gallon per year market for corn-based ethanol. The standard has strong political support in corn-producing states but is disliked by the powerful petroleum industry, making reforms the subject of much heated debate — though that debate rarely hinges on environmental or food-system concerns. There’s little infrastructure in place to help farm­ers transition to cleaner, healthier, less extractive methods of food production. And they have little incentive to do so when they don’t pay the cost of their pollution. We need policies that support the use of farmland for human food, the development of biofuels that are climate-friendly — using low-in­put crops grown on degraded land — and insist on the efficient and beneficial use of agricultural inputs and byproducts. Since many on-farm decisions can be influenced by federal ag­riculture policies, revising the farm “safety net” and other Farm Bill programs could significantly change practices and crops to reduce waste. Also, the RFS provision to incentivize next generation biofuels has been limited by lukewarm regulatory support and lackluster technological progress. We need infra­structure to support farmers to diversify crops and run farms more sustainably, using natural strategies like cover-cropping to reduce chemical use and con­serve soil health. Such a policy shift need not be a partisan issue. A. G. Kawamura, a former California agriculture secre­tary who is a member of President Trump’s agricul­tural advisory committee, observed that most farm­ers “are hoping to leave their land more productive than they found it. . . . What a farm bill should do is provide tools that help farmers be more resilient,” such as cover crops, new technology that supports precision agriculture, and other innovations in farm management as potential areas for investment. Governments can support such farms or ranches by preferential purchasing. Con­sumers can buy certified products, from organic vegetables to regen­erative grass-fed beef, or can shift their own diet away from industrial meat and processed foods. Greater enforcement of pollution laws can eliminate hidden subsidies for inef­ficient industrial operations. Perhaps, however, an even more fundamental shift is needed. Ag­riculture consumes fertile land to produce what we need most — the four Fs: food, feed, fuel, and fiber. Now, we still need those, but we also need a stable climate. We must add a fifth F for future. This is both the future of agriculture, which depends on stable weather patterns and is harmed by weather extremes, and the future of humanity. Climate stabilization, through the cultivation of crops and plants that can sequester carbon in soil and biomass, must be seen as an appropriate aim of agriculture. Many agricultural practices have been demon­strated to reduce greenhouse gas emissions from farming and ranching. Operations that go further and actually reduce atmospheric carbon through permanent sequestration should have the opportu­nity to profit by so doing, because they would be “producing” an important social need. And if we reduce the land used for wasteful crops, there will be millions of acres available for the new crop of carbon-sequestering activities. Seeing climate stabilization as a valuable product of agriculture offers a wealth of opportunities to rural landowners. Carbon sequestration could be another “crop” for which they can be paid. In some ways, this is already happening. When a farmer leases land for wind turbines, there may be less land for crops, but the farmer is helping address climate change and getting paid for it. And, while it is not designed or thought of as a climate program, when farmers are paid to preserve wetlands acres through the Conservation Reserve Pro­gram or the Agricultural Conservation Easement Pro­gram, they are being paid to help stabilize the climate. Of course, a broadly applicable price on carbon would provide a market for carbon sequestration activ­ities — producers could shift practices to lower emis­sions and increase soil and plant carbon storage — but even before the United States adopts an economy-wide policy, farmers and ranchers can find value in “selling” climate change mitigation. For example, California ad­opted a protocol for rice farmers that would reduce methane emissions, al­lowing farmers to receive (and then sell) credits in the California carbon market. Many states give landowners a property tax break for preserving land in forestry or agriculture; at least one state, New York, has proposed in its Empire Forests for the Future initiative to allow landowners to get a tax reduction for preserving their land for carbon sequestration. These programs are few and far between right now, but they suggest that the path ahead is clear and practicable. Expansion of such programs could be a good way to address the two na­tional needs of assisting rural econo­mies and curbing climate change. We cannot meet food demand and also satisfy other human needs by expanding our current industrial ag­ricultural system and continuing business as usual. The system is wasteful by design, making inefficient use of land and resources, and results in the pollution of water, air, and the climate, and the production of un­healthy, un-nutritious food. Expanding an inherently wasteful system is not the way to feed people. We must re-examine how to use our land and other agricultural resources more efficiently, and change policies that support a fundamentally inefficient model. Govern­ment policies should support a more efficient, less con­centrated agricultural system that produces more food and less feed, sustainable fuel and fiber, and protects our climate future. 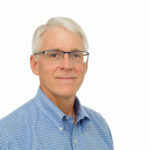 Peter Lehner is a senior attorney and directs the sustainable food and farming program at Earthjustice. Previously, he was the executive director of the Natural Resources Defense Council and the chief of the New York Attorney General Environmental Protection Bureau. He also manages two farms. Previous articleEuropean Geosciences Union, “Removing CO2 from the air required to safeguard children's future” Next articleTransport & Environment, "Diesel: the true (dirty) story"